Updated | A Battery Park senior was run down and killed by the driver of a jitney bus on Thursday night steps from her apartment. 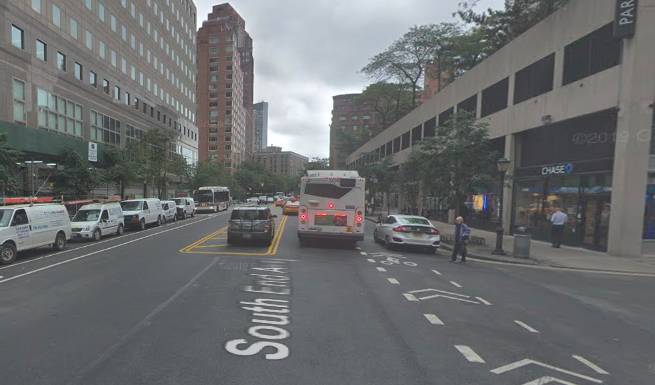 The Daily News blamed the woman, Arlene Kalfus, 81, for allegedly crossing mid-block, but the design of South End Avenue is also likely a culprit here. The once-quiet roadway in the village-like Battery Park City is now often packed with taxis double-parked and illegally parked cars and trucks, thanks to on-street car storage and a center median wide enough for a truck. According to police, the bus driver, whose name was not released, hit Kalfus on South End Avenue between Liberty and Albany streets at just before 7 p.m. He remained on the scene after hitting Kalfus and was not charged. The Daily News reported that the 57-year-old driver worked for the Downtown Alliance, which runs about a half-dozen jitney buses on a fairly lengthy route through Lower Manhattan. The Downtown Alliance said its drivers are hired by Golden Touch, another transportation company. That company did not return a call. The Downtown Alliance expressed its condolences for Kalfus in a statement. This is an enormous tragedy. Information is hard to come by right now and we are awaiting further information and details from the police department. As we do so, our thoughts are with those who were close to Ms. Kalfus. Road deaths are soaring in 2019, with Kalfus being the 50th victim so far this year. That number is up almost 30 percent from the same period last year. The perception is that Battery Park City is a quiet, residential neighborhood, but danger lurks. Since January, 2017, there have been 46 crashes on South End Avenue alone, injuring six people and killing one. In the entire neighborhood over the same period, there have been 150 crashes, injuring 19. Story was updated to provide more information from the Downtown Alliance. i ride there to visit my friend’s mom. a lot of seniors are in buildings on south end. they should have absolute priority over cars, and the double parking (a consequence often of the illegal parking-by-placard of our good-for-nothing city workers and mostly cops) must be stopped. basically all parking around there should be banned, and living in battery park should be bus/walk/taxi only. I live across the street from where this happened (and when I got home last night, the area was taped off by the police). The News may be correct that the victim was not in a crosswalk, but the reality is that on one side of the street you have the exit from Gateway (a large, five-building high-rise residential complex), and on the other side is a major entrance to Brookfield Plaza. People travelling to and from Gateway cross here all the time, and there probably SHOULD be a crosswalk there, even if it is technically mid-block. While it’s true that the Downtown Alliance operates red Downtown Connector buses along South End, the bus in question was white, and not one of the Downtown Alliance buses. And speed is a real question; the speed limit on South End is 25 mph — while a fatality at that speed is certainly possible, speeding along the route is commonplace, largely because of the width of the street and its traffic lanes. While it’s no Queens Boulevard, South End could certainly use traffic calming measures (and, btw, better bike lanes). Actually, I just checked, and at a presentation by the Battery Park City Authority on possible changes to South End Avenue last year, one of the recommended improvements was actually adding a crosswalk at the Gateway exit. I got a ticket once for treating that light that’s visible in the back of the picture as a stop sign while on bike. The cop said they had gotten a lot of complaints about bikes. I was like, I live on this street and cars drive like crazy here. This is totally foreseeable however. You’ve got a taxi stand there where cars do u-turns all day. It’s nuts that any car is capable of going fast enough to kill someone in this neighborhood. It’s literally just 3 blocks here and 3 blocks there. You can’t go anywhere. Many intersections in Battery Park city do not have signals and thus do not have crosswalks striped. The lack of crosswalks is terrible. There needs to be painted crosswalks at each intersection which either a yield or a stop sign added where there are no lights. Otherwise pedestrians wait and wait and can not get across and the drivers act as if they have a permanent right of way. Even better, raise all of the crosswalks to force drivers to slow down. It’s nuts that there are even traffic lights here. Narrow down these streets, add medians, raise the crosswalks, and the intersections can be uncontrolled. You could even do roundabouts which would allow for a safe alternative to dangerous and illegal U-turns.